It allows you to change theme look without editing core theme files. 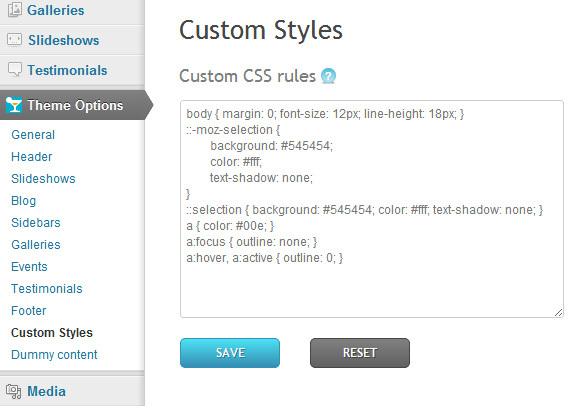 And what is important, CSS rules are stored in database and will be saved after theme update. Great training sessions. I sold two products we learned about the very next day! Connecting suppliers and distributors in the fun hands-on event hosted by NetPlus Alliance and Morris Marketing was such a wonderful and beneficial event. With informative Suppliers introducing new innovative products I am excited to apply this knowledge in giving our customers premier products from the best suppliers. Thank you NetPlus Alliance and Morris Marketing. Since joining NetPlus we have added almost exclusively partner vendors, strengthened our relationships with existing NetPlus vendors and in several cases switched out non-member vendors for those within the group. Looking forward, we are very happy to see many of the programs get even stronger and key new vendors getting added. We anticipate the 2015 Annual Convention to be even better than last year but of course it’s not all work, we look forward to seeing a lot of familiar faces again soon! NetPlus Alliance trainings really are helpful to our Kaman locations. Most of the employees are bearing folks. Most of the products mentioned are like a foreign language to our guys. Now they know who and where to call when customers call asking about products outside of our core mix of products. I wish we could have sent more people to the training. Thanks for all the hard work put into setting the trainings up! The 19% overall growth JPW (formerly Walter Meier) experienced with NetPlus distributors was well above the industry standard and our own expected growth. This is a tribute to your members’ dedication to our brand and products, and we appreciate them very much. Your marketing efforts on our behalf are second to none, and we enjoy working with your team to get the word out about our brands. NetPlus Alliance provides the tools our company needs to be competitive in an ever-changing market and build long-lasting, valuable relationships. Heather Terrell Berry Gogel Fastener & Industrial Supply Co. The NetPlus training programs provided our sales team with a hands on, informative training that greatly increases both product knowledge and confidence. Knowledge = Confidence = Success! The NetPlus Marketing Program is a cost-effective avenue to grow our brand and to communicate our message effectively within the NetPlus community. I appreciate all that you do to help the ‘small guys’ to compete with the big catalog houses. You have always been willing to go the extra mile whenever I ask for help. NetPlus allows us the flexibility to make our own purchase decisions and run our business the way we want. They bring value through extensive programs and enhancing relationships with manufacturers in the group. NetPlus Alliance supports independent distributors with resources and incentives that promote profitable relationships. National and regional meetings enable us to network with companies that share our passion to grow and to run successful independent businesses. I have been a vendor for years. Throughout that whole time I have felt like I was dealing with a neighbor that looks out for me as well as the member. Too many times groups are just in it for the members. It has to be two way. The NetPlus program is a great fit for us. The membership fee is reasonable, with the benefits outweighing the fee. As a small business in a big business world, it can be difficult competing with the large national suppliers. NetPlus makes it easy. The 19% overall growth JPW (formerly Walter Meier) experienced with NetPlus distributors was well above the industry standard and our own expected growth. This is a tribute to your Members’ dedication to our brands and products and we appreciate them very much. Your marketing efforts on our behalf are second to none, and we enjoy working with your team to get the word out about our brands. I don’t believe we would be as far along in our business without the help and support of NetPlus Alliance.